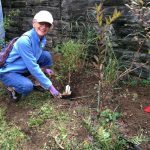 Home » Caretaking » More Wildlife Habitat Plantings at Kirk Lane! 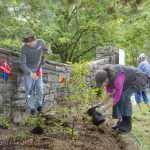 For our 6th National Public Lands Day on Saturday, September 24, we installed wildlife habitat plantings at the lovely Kirk Lane entrance to Glen Providence Park! This year, 15 adults, teens, and children volunteered a combined 79 hours digging, planting, mulching, installing edging and deer fencing, raking, and watering! These planting events draw truly lovely people who are inspired to spend a Saturday morning working to improve a local park, and the morning was filled with fun conversation and laughter. This was Phase Two of our Kirk Lane project, which we started on National Public Lands Day in 2015. 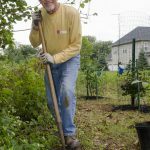 We expanded on last year’s plantings with an additional 22 native trees and shrubs, and 22 native perennials – the complete list is below. 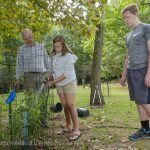 The plants benefit wildlife by providing seeds, nuts, fruits, and nectar for mammals, birds, butterflies, and other pollinators, in addition to helping to slow down and absorb surface storm water runoff. 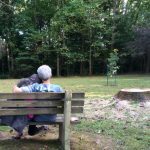 We take the long view when planning what to plant, including replacement of fallen canopy trees. A large Tuliptree had split and fallen in the lawn area by the entrance just a few weeks ago. On Friday morning, Delaware County Parks & Recreation removed the tree to make way for our plantings. 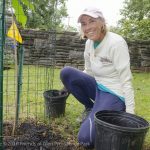 Twenty-four hours later, we planted three canopy trees – Chestnut oak, Blackgum, and Red maple – to someday replace it! 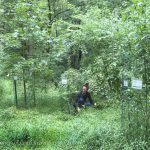 We also added two more Pawpaw trees to last year’s three, creating a future grove to provide fruit for humans and wildlife alike. This once-common native fruit was enjoyed by George Washington and Thomas Jefferson. When you see the plantings, envision how it will look in the decades to come! Our hours spent planting are preceded by many hours of planning and site preparation. The week before our planting, our Invasives Removal team cleared vines covering shrubs and trees adjacent to our plantings, beautifying the area and making room for native plants. In addition, we were able to remove 15 of the deer fences from our 2013 plantings by the pond (which are now thriving! ), to reuse for this year’s plants. We have so many to thank for their help with this project… starting with all those wonderful volunteers! The volunteers were fueled by delicious coffee, generously donated by Seven Stones Cafe, and by donuts thoughtfully contributed by one of our volunteers! We are tremendously grateful to neighbors of the park for the use of a 150’ garden hose, for additional watering, and for allowing us to run the hose from their house to water the plantings! 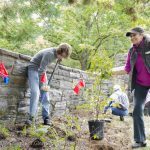 Delaware County Parks & Recreation removed the fallen Tuliptree, provided the funding for the plants, and delivered the mulch. 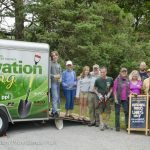 Taylor Memorial Arboretum donated native trees, shrubs, and perennials again this year, and Delaware County Conservation District delivered their Conservation Planting Trailer full of all of the tools we could need! 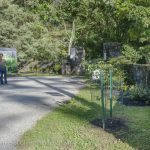 Garden Influence and Redbud Native Plant Nursery provided invaluable expertise, and Friends of Glen Providence Park donors funded the supplies for this project. We are grateful to all of these people for making the plantings possible! The next time you are at the Kirk Lane entrance, look for these native plants, and check out the fun in the photos below – just click on one to scroll through them. Thank you to George Tate for the wonderful photos of National Public Lands Day. *John Wenderoth donated two hybrid (B3F3) American chestnuts via the American Chestnut Foundation, grown at the Mt. Cuba Center in Hockessin, Delaware. 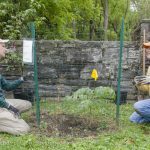 Read about efforts to restore the American chestnut, and the two young surviving trees we found in the park! 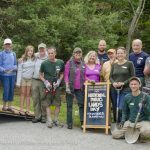 The fabulous volunteers & Conservation Trailer! Some well-earned rest at the end of the day!